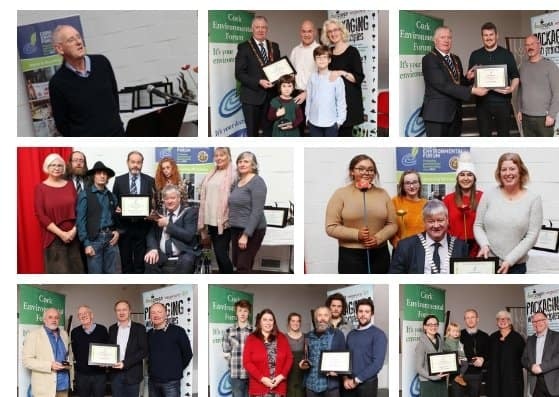 Cork Environmental Forum Awards Ceremony showcases and recognises the dedication and work of individuals and groups across Cork caring for our environment. The packed audience attending the Cork Environmental Forum (CEF) Awards Ceremony at the Firkin Crane Centre on Wednesday 28th November, were inspired and energised by the commitment, leadership and dogged determination of all the Award recipients who are taking action to improve our environment. Derry O’Farrell, CEF Secretary, thanked everyone who made nominations to the Awards in 2018 and the panel, made up of James O’Donovan and Helen Barrett, CEF and Justin Byrne, Irish Environmental Network, who had the unenviable task of selecting the Winners in each category. He also referenced the recent wake-up call reports of the International Panel on Climate Change, the World Wildlife Fund and just on Tuesday the UN Report on Emissions. Whilst CEF was early to the table in understanding the urgency of looking after the environment, the situation is so much worse than in 1995, however, finally people are perhaps beginning to take notice and get more engaged in action and tonight is about celebrating such leadership at a local level. Karen Loxton, Cork Nature Network introduced Chris Moody, winner under the Outstanding Individual category, who exemplifies the commitment and dedication to wildlife and care of the environment through his work on the Cork Otter Project and his efforts to protect and restore the River Bride. Chris was presented with his Award by the Lord Mayor, Cllr. Mick Finn. Chris thanked all the others involved in the project and his family who are always such a support and a motivator as he wants his children to also enjoy the river and the presence of the wonderful wildlife it supports including the charismatic otters. Richard Leahy made the introduction to Barry O’Connor who was acknowledged with an Outstanding Individual commendation for his vision and unstinting work in setting up Refill Ireland, which helps to reduce plastic waste whilst providing easy access for the public to water refills. Being rolled out in Cork in conjunction with Cork City Council and CEF, again the Lord Mayor did the honours with the presentation to Barry who had travelled from Dublin to be there. Barry is very motivated in his quest to eliminate plastic waste and is hoping to roll the Refill project out throughout Ireland, he complimented Cork is being one of the forerunners to embrace the initiative. Bantry Bay protect Our Native Kelp Forest is the Community and Voluntary Category winner for their efforts to protect the marine environment. Tomas O’Sullivan gave an outline as to why the group set-up and how it has brought together the varied interests of the coastal community to fight the mechanical harvesting of the local kelp in the Bay. The group through the campaign are deepening theirs and the communities knowledge of the many benefits and services of kelp and the complex but fragile marine eco-system. They are also networking with other coastal communities throughout Ireland to support and work together to protect our coast. The Award was presented by Mayor of the County, Cllr. Patrick Gerard Murphy and in his acceptance speech Declan Bevan wished that everyone present could see our magical underwater world which is such a valuable resource. He also highlighted the positive impact of the campaign, despite the effort, work and resources people have put in, the unforeseen consequence has been to forge links and strengthen the communities around Bantry Bay. Derry O’Farrell , nominator of Cork City Council, the winner under the Public Sector for their initiative to eliminate single use cups in the council and provide all staff with a reusable cup, gave credit to their foresight in introducing this initiative to a large public body. It is very replicable for other public and private organisations and you need someone to take the lead. Derry who is passionate himself in trying to eliminate waste also acknowledged the Council’s ongoing efforts in waste reduction, by moving towards a more circular economy with support of initiatives such as Refill and Boomerang Enterprises. Noel Murtagh, Senior Engineer, Environment and Recreation collected the prize but referenced that it is his colleague Mary Walsh, away at present, who had the determination and vision to follow through in implementing the elimination of single use cups in the Council. Justin Byrne, Irish Environmental Network in presenting the prize complimented Cork City Council and the importance of large public bodies in providing leadership. Siobhan Hardiman who nominated TWIG Refill Shop in Clonakilty outlined her reasons for nominating this new enterprise, as she said “the TWIG that grew from the Olive Branch” in bringing this waste free shopping option to Spiller’s Lane in Clonakilty. 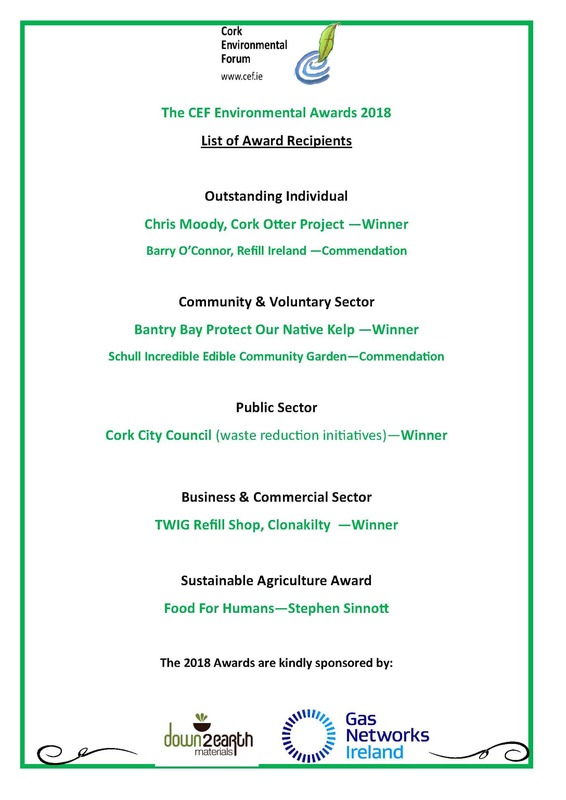 Not only is TWIG contributing hugely to waste minimisation for the conscious consumers throughout West Cork it is also adding to the businesses environment of the town and with the addition of a room overhead that is used for many community activities. Andie Beatty and some of the team were there to collect the prize which was presented by Olan Hodnett, Down2Earth Materials, who referenced their own efforts to reduce waste and harm to the environment as suppliers of low impact, low carbon food service disposables. Mary Wedel, proprietor of An Tobairin, nominator of the winning Sustainable Agriculture initiative, gave an insight into the dedication and innovation of the Sinnott family in providing the most wonderful organic produce from a small holding near Ballinhassig. Stephen Sinnott, in accepting the Award for his enterprise Food for Humans thanked his customers, the local businesses and restaurants who have supported him and especially his wife Bridget and wider family. Ian Kilgallon, Gas Networks Ireland, presented the Award and mentioned their own efforts in conjunction with Ballyhoura and farmers to more towards renewable gas. Bernadette Connolly, MC for the evening and Coordinator of CEF congratulated all of the winners again and commended them for the wonderful and inspiring work you are doing which is also an actionable commitment to making our environment better. She referenced Kevin Casey, Bogwood Sculptures, who is the creator of the unique and beautiful herons from ancient oak and yew buried beneath the midland bogs and Martha Cashman, ceramic artist who is responsible for the Clay Birdfeeders. Bernadette also thanked Ann, Tony and all the team at the Firkin Crane for their support and hospitality every year, Diane Cusack for the photos, the sponsors of the Awards Down2Earth materials and Gas Networks Ireland. Thanks also to Cork City and Cork County Councils who are the main funders of the work of CEF on an annual basis. Special thanks were given to all of the volunteers and members of CEF, including a very dedicated and active Management Committee and members who engage voluntarily throughout the year o so many initiatives from planting trees to surveying the Coast. Some of them prepared the refreshments this evening including Murielle Pelay, John and Sofia Barimo, Richard Leahy, Matt Jones and Anna Pozzati currently on placement with CEF. As referenced by Derry at the beginning the UN report says we need drastic large scale effort, this is somewhat overwhelming. Such large scale effort, needs greater national and global leadership and ambition, but we in CEF believe it also relies on replicating and growing the effort every individual and project has shared here tonight. Positivity begets positivity and your efforts and leadership in implementing different practices which are focused on a more sustainable approach is what ordinary people really need and now want. So as we come to the close of another year we look forward with renewed hope from the experiences you have shared and the broader understanding that is growing in our society that our environment is the very basis of our continued existence and that we can all get involved in changing the course we are on. We are delighted to announce our Annual Environmental Award Winners for 2018. We thank all of those who engaged with the nomination process this year, without your interest and support the Awards wouldn’t continue to be such a great event. ← Reuse Month – Glitz & Glamour Fashion Show Sat. 27th Oct.